The Shrine of Remembrance towers over the city of Melbourne. 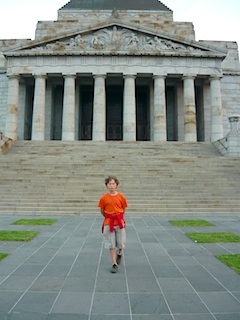 It is the national War Memorial of Victoria and built to line up with Swanston Street, the main street of Melbourne. It can be seen from anywhere along Swanston Street. It is dedicated to Australian soldiers and a reminder of the fallen, from WW1 to the present. Have you ever mourned for the deceased? It is unimaginable to understand the losses of a nation when it comes to thinking of the First World War. 19,000 Victorians were killed out of 114,000 that were enlisted in this war, that is one in six! Due to this huge loss, a Shrine of Remembrance was created for the grieving community after WW1 in Melbourne, Australia. Soldiers killed in the war were buried at distant locations away from home - not many Australians travelled abroad at that time. Therefore, Victorians needed some place to grieve their losses. The Shrine was created as a war memorial to honor those who served in the war as well as those men, women and children who remained in their homes. It was built in 1928 when funds for this important memorial were raised, despite difficult economic times. The location was chosen as a central place where people could grieve individually, as families or as communities, and that would be visible throughout Melbourne. The purpose of this structure was to preserve memories of the ones lost in the Great War. Its design was selected from a competition among Australian artists and architects, with the winning design being by two return-soldier architects. It is designed to embody the classical virtues of Love, Peace, Courage, Integrity, Strength, Faith, Honor and Brotherhood and to remind us of those who bravely fought for their country and those who had to bear the losses of their loved ones. 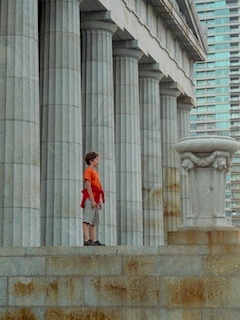 The Melbourne Shrine of Remembrance is inspired by Greek design. It is made from the Tynong granite and consists of a central sanctuary surrounded by the Ambulatory, a place for walking. The sanctuary has the marble Stone of Remembrance with the words, "Greater love hath no man" engraved in it. The crypt has a bronze statue of a father and son, representing two generations of soldiers who fought the First and Second World Wars. The regimental colours and series of bronze panels represent the navy and army units that took part in World War I. The northern steps of the Shrine are used today as the Ceremonial Entrance to this symbolic building. From 1935 Shrine Guards were selected by the Chief Commissioner of Police to guard this War Memorial through the generations of Victorians. From the twelve highly decorated veterans of the First World War who were selected as the Shrine Guards, Lieutenant George Ingram was considered their unofficial Leader at that time. These guards were subjected to observe many changes in the community and view the activities at the Shrine. In 1995, a woman was appointed as a Shrine Guard. This was considered as a significant change. 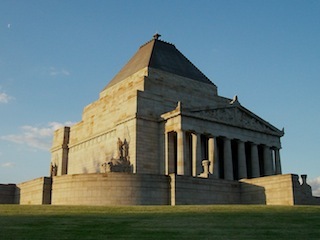 The Shrine especially honors the ANZACs, the Australian and New Zealand Army Corps that had fought in Gallipoli in WW1. At a time of nation building these contributed to the Australian identity with the attributes of reckless valour for a good cause, enterprise, resourcefulness, fidelity, comradeship and endurance and to never give up. This is also celebrated as ANZAC Day on April 25, the day Australians cheerfully landed on the Gallipoli peninsula, in effect sailing off to death and Glory. ANZAC Day shaped the national sentiment and is seen as the Birth of the Nation when Australians courageously fought for liberty and against despotic militarism. This is from the Freemans Journal, Sydney, April 27, 1916: No matter how the war may end, we are at last a nation, with one heart, one soul, and one thrilling aspiration. There is mourning in our homes and grief in our hearts and the flower of our youth will not return to us; but there runs through the Commonwealth a lifting spirit such as nit never knew before. In the spirit of this defiance and commitment to liberty as a nation, and in honor of the Australian characteristics of mateship, initiative, ingenuity, larrikinism and egalitarianism, the Shrine of Remembrance was created. To never forget! 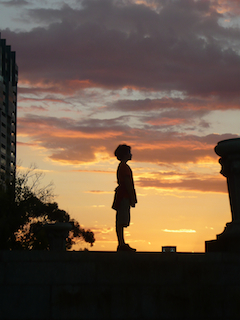 The Shrine of Remembrance today is a peaceful place to visit. At its commanding place high above the city, you are removed from the noises and hustle of Melbourne. There are exhibitions, talks, events and ceremonies such as Remembrance Day and monthly memorial services. It continues to be a place of high importance in educating and interpreting the War stories of the Victorians to the generations that followed. It keeps the spirit of the Victorians who fought with all their hearts for the love of their country alive, through education, public programs, exhibitions and commemoration.